The architectural design and interior finishes of this stunning home have harmonized beautifully. 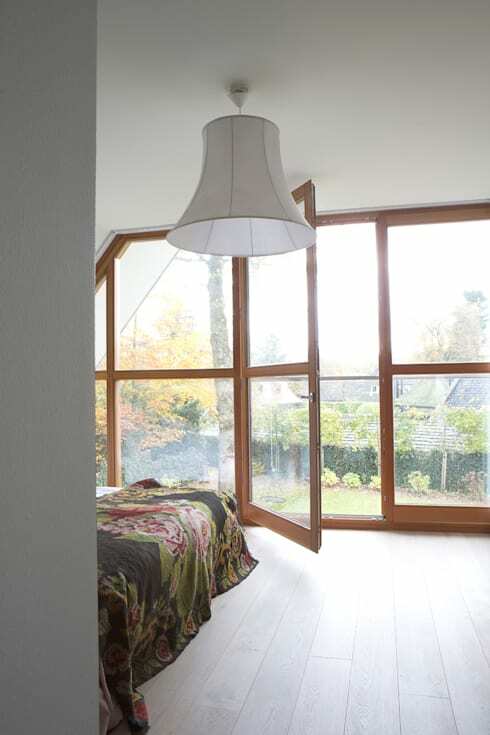 The home is full of varying wood tones that feel soft and supple. They are all lit by huge windows in the back of the house that allow in natural light, filtered and unfiltered, giving everything inside a bright glow. This serves as the perfect background for a variety of vintage touches, from industrial lamps to old leather briefcases. 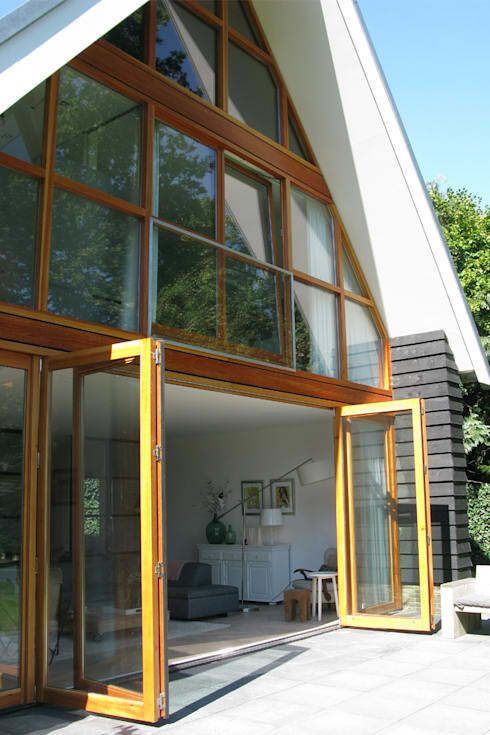 Bok Architecture has named this Dutch home Villa Blaricum and with it have achieved a masterpiece of mood. The back wall, composed entirely of windows, creates beautiful spaces that still remain private. Its a lovely an environment you simply have to see. 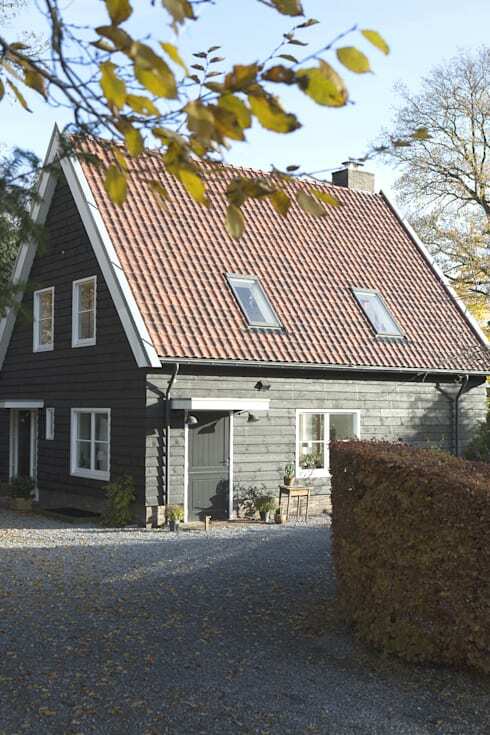 This building mimics old barn houses with deep character and dark woods. The white trim and window finishes brighten the design and give it a slight modern touch. This is the back wall made of windows. The functionality here is phenomenal, the huge sliding doors don't just allow the residents outside but they welcome the sun and wind into the indoor space as well. Lets see how this breathtaking feature harmonizes with the rest of the home. From the inside its clear that these windows provide some bright light. The room has been decked out with vintage and recycled pieces. From the rich colours of the leather briefcase and wood cabinet to the light colours of the pastel painted cupboards and bright carpet, there's a large range of tones here. While broad, they create an overall atmosphere that is soft and dreamy, where dark tones feel supple and bright tones radiant. The kitchen is arguably the darkest space in the house, but it has virtues as well. 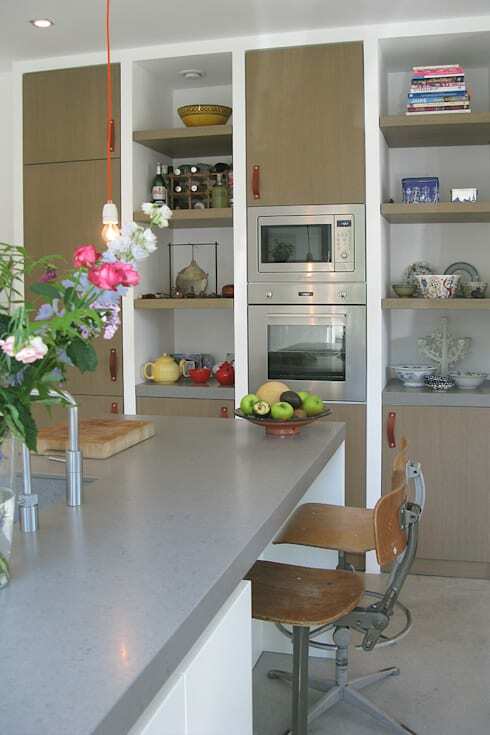 The rustic chairs and matte cupboards with leather straps for handles are full of character and are cost-effective as well. The open cupboards function as a display case for some beautiful china, wine, teapots, and other items. Clearly the homeowner is a collector and its lovely that this functional design has allowed them space to display their favourite pieces. This lovely dining room is full of light, including some unique lighting fixtures that feel rustic and unique. The sharp shape of the chairs is highly modern, and its nice to see that the interior designer has accommodated the children with some specialized chairs that still look modern and stylish. Who says the chairs all have to be identical? Simply balance unique chairs by placing them across the table from one another. We've even seen dining rooms where each chair is unique. You can find plenty of styles to mix and match here. A fireplace is a warm traditional feature that can be designed to look modern and chic. 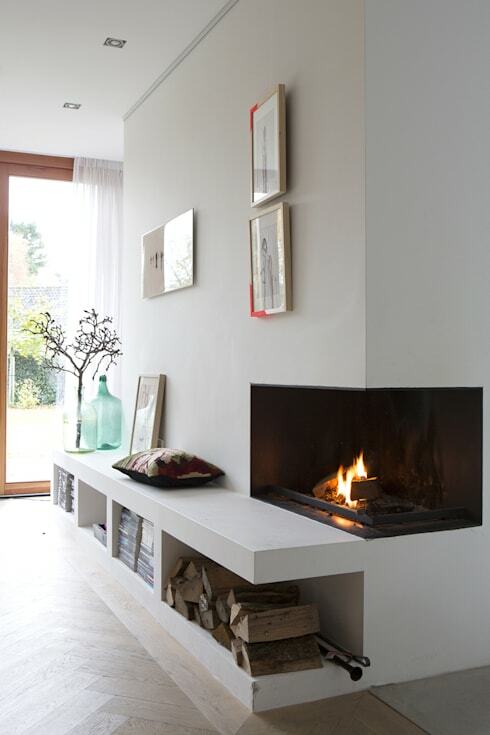 In this case, the sharp white design is modern but mingled with the visible collection of firewood beneath the flame. In this home of balance, the fireplace's mantle is placed level with the flame where more vintage pieces can be displayed. A similar balance is struck in this home, where its fireplace combined modernity and square design with romantic colours. It's no surprise that this combination is wildly popular, with these lovely results. This bedroom has a phenomenal balcony space that provides privacy and greenery. The light is stunning, and the white palette amplifies that. The floral bedding is a lovely choice, to echo the greenery found outside. If this has you dreaming of a lush balcony you'll want to look at this wonderful example. 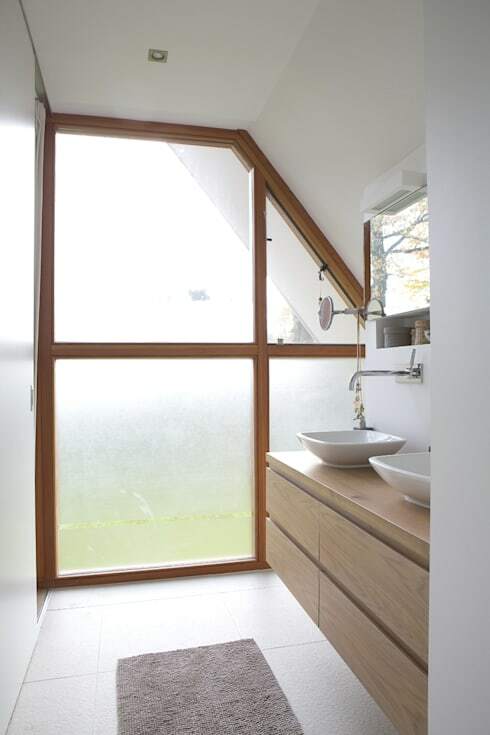 The bathroom is next to the beautiful back wall and is frosted to maintain privacy. The effect of this natural light is simply glowing. The space is minimalist, with few colours of decorative elements. Instead, it feels refreshing and uncluttered, just the kind of ambiance you want for a bathroom. This final shot of the exterior reveals the full scope of those fantastic windows. The warm wood feels traditional, along with the dark siding, but the white roof adds the essential modern element that makes the home feel fresh and bold. 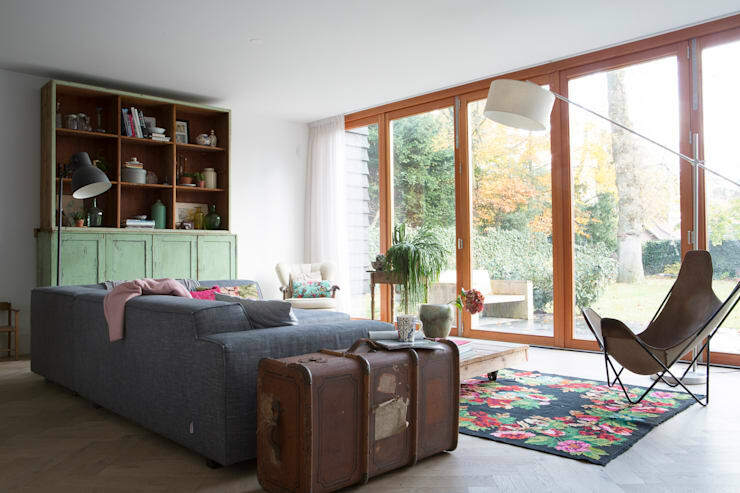 Do you have any vintage features in your home? Let us know in the comments!